Odd and sudden rotting of the crown is usually caused by a group of water mold fungi and can happen during wet and cold springs. In appearance,you will notice a very slimy, gel-like spot starting either at the top of stem or on the side that causes the plant to fall over. 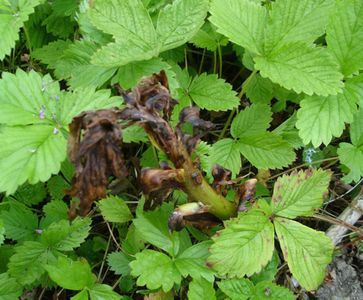 If the soft rot is confined to just the top of the stem, it is possible to save the leaves enough to allow the bulb to regain size for the next blooming period. However, once the stem is completely browned like in the large photo, all is lost for this season. This is definitely weather related and on par with the Botrytis fungus. Neither this nor Botrytis is resident in your bulbs, it is strictly a soil thing, so don't dig and destroy your lilies. The decay of the shoots is for this year only and they should recover, but some measures should be taken now. Spraying with a copper-based fungicide every 7 to 10 days as a precaution, rather than every 14 days is recommended when a cool spring is forecast. If the stem is only showing rot at the top and the lower leaves are still healthy-looking, remove the top, cutting below healthy tissue on a dry day and let the stem heal before it goes any further. Dip your knife or pruners into rubbing alcohol or bleach between cuts to keep from spreading the fungus from one plant to another Your goal is to keep as many leaves as possible on the stem to rebuild the bulb for next year. If there is deep mulch around the lily stems, remove all but a thin layer to let the top layer of soil dry quickly. Now spray your entire lily bed with a good fungicide with copper hydroxide or copper sulfate as the base. It should be blue in color and leave a blue residue on the leaves, not pretty for cutting the blooms, but you want to keep the fungus spores from causing any more damage. If you grow roses, then you already know to clean up fallen leaves and not put them into the compost; ditto with the lily stems/leaves, keep weeds pulled and let the air circulate freely around the stems. (July 1, 2010) I looked in one of the big box stores a couple of weeks ago for fungicides, but most seemed to only be preventative sprays, not for killing the spores. The most effective sprays have copper in them and leave a residue. (This was after I finally worked my way past all of the "death and destruction" weed killers and pesticides, no wonder the honeybees are having a tough time, with the arsenal of chemicals available to the homeowner! As you probably guessed, we garden as organically as possible.) The "fungicide" I finally chose had a blue color and had some type of copper, but was thin, so we'll see how it does here around the house. 'Champ' is a commercial product we use in the field and it is somewhat like a gel, so go to a full service nursery or a farm co-op, don't stop at the local "big box" store. The old-time "Bordeaux" mixture of Hydrated lime, bluestone (Copper sulfate), water and a spreader-sticker was used for years, but only a few of the newer fungicides like Kocide work well to stop the spread. What causes Stump Rot? Many times when there is a bout of cold and wet weather when lilies are emerging, soil can lodge in between the layers of the growing tip and not allow the moisture to drain away quickly. If there is damage from slug nibbles the fungus can spread before we notice what is going on. Right now on our home farm, 7/2/10, we have 51 degrees and heavy drizzle in our valley, but our usual temperatures for this time should be around 75 degrees. If your garden has gone through a similar cycle in the past several weeks, then do spray your fungicide a little more frequently this summer. Spray in the morning just after the dew has dried, but not during the heat of the day. Remember that hot/humid and cold/wet encourages fungus, so also try to avoid overhead watering late in the day, the foliage needs time to dry. We haven't even turned on the irrigation system here at home this summer. The propagation field about 5 hours away to the south is being sprayed with fungicide every 5 days, with the norm being every 14 days, so you can imagine the amount of cold and wet weather we've been having. Spraying the soil with a copper based fungicide just as the sprouts are beginning to emerge in spring is the single most beneficial thing you can do next spring to avoid both this issue and future Botrytis speckles. With the crazy weather across the USA this year, gardeners who have never before had problems with fungus are now seeing signs of it.